In these situations, you should take advantage of the ability to copy your passwords from 1Password. 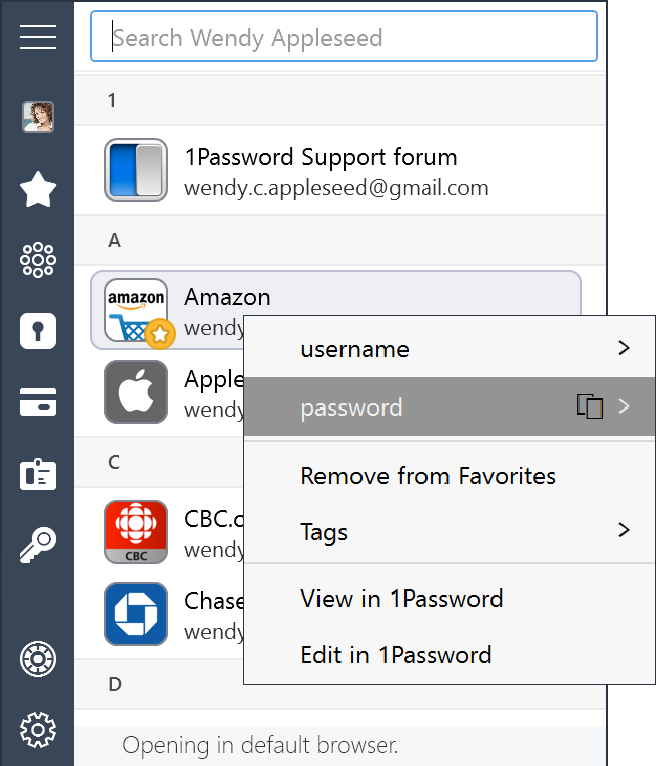 1Password provides efficient shortcuts for copying passwords to the clipboard, so you can paste them into other apps and windows. To open 1Password mini, click the 1Password icon in your menu bar or press Option-Command-Backslash (\). If 1Password is locked, enter your Master Password. Then use the mouse or arrow keys to navigate to the item, or start typing to search for it. Mouse or trackpad: Click the password field in the item details. Keyboard: Press Shift-Command-C when the item is selected. 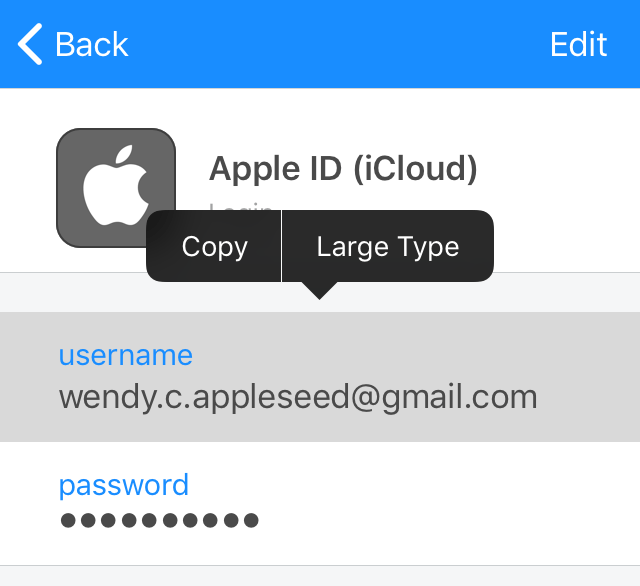 To copy a username, press Control-Command-C.
To copy a one-time password, press Shift-Control-Command-C.
To open an item from 1Password mini in a separate window, click in the top right corner of the item details. 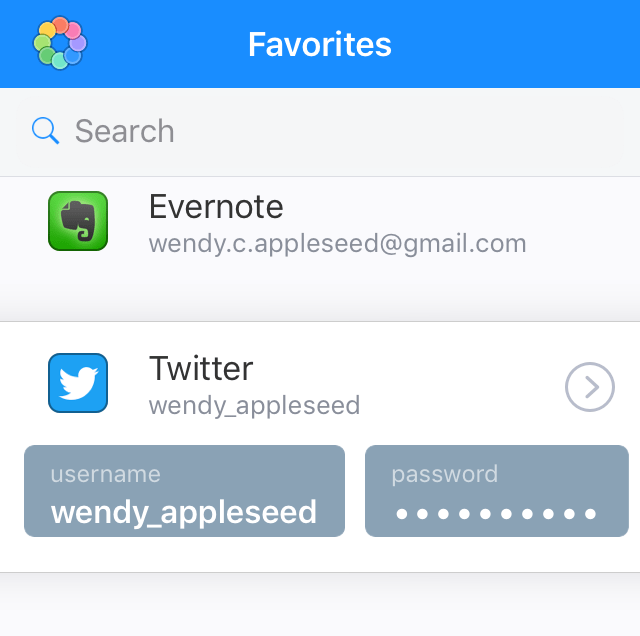 Then you can switch to another app and copy your username and password without needing to open 1Password mini again. For your security, 1Password can automatically remove copied passwords from the clipboard. Choose 1Password > Preferences, then click Security. Enter a time in seconds next to “Clear clipboard contents after”, or turn off the setting if you never want 1Password to clear the clipboard. 1Password provides efficient shortcuts for copying passwords to the clipboard, so you can paste them into other apps. To copy a password, swipe right over an item, then tap Copy Password. Tap an item to view its details, then tap your username to copy it. Switch to another app and paste your username. Switch back to 1Password, and your password is copied automatically. Switch to the other app and paste your password. If your item includes a one-time password, switch back to 1Password a final time, and it will be copied automatically. When you mark an item as a favorite, you can quickly copy any of its details. To copy item details from Favorites, tap an item, then tap the detail you want to copy. For your security, 1Password can automatically remove copied passwords from the clipboard. Tap Settings > Security, then tap Clear Clipboard. Choose when you want 1Password to clear the clipboard. To open 1Password mini, select the 1Password icon in the notification area or press Ctrl + Alt + backslash (\). If 1Password is locked, enter your Master Password. Then use the mouse or arrow keys to navigate to the item, or just start typing to search for it. Mouse or trackpad: Right-click any item in 1Password or 1Password mini, then click to copy the username, password, or other item detail. Keyboard: Press Ctrl + Shift + C when the item is selected. For your security, 1Password can automatically remove copied passwords from the clipboard. Choose 1Password > Settings, then click Security. Choose when you want 1Password to clear the clipboard. 1Password will attempt to restore content that was previously in your clipboard after it automatically clears what you copied in 1Password. To copy a password, tap an item to see its details, then tap the password and choose Copy. For your security, 1Password can automatically remove copied passwords from the clipboard. Tap Settings > Security, then tap “Automatically clear clipboard” and choose how often you want 1Password to clear the clipboard.